Sara Ali Khan and Ibrahim Ali Khan are the popular siblings of B-town. Sara has never shied away to talk about her adorable brother. There are times when we get to see her hanging out with her little brother on the streets of Mumbai and having fun. And fans of this young actress often love to see this sibling chilling out. On the occasion of National Siblings Day 2019 (which was yesterday), Sara has shared the cutest photograph on Instagram of her with her brother Ibrahim and we think it is the perfect one. Siblings Day 2019: From Ananya Panday - Rysa Panday to Navya Naveli Nanda - Agastya Nanda, Here are Some Lesser Know Brother-Sister Jodis of Bollywood. 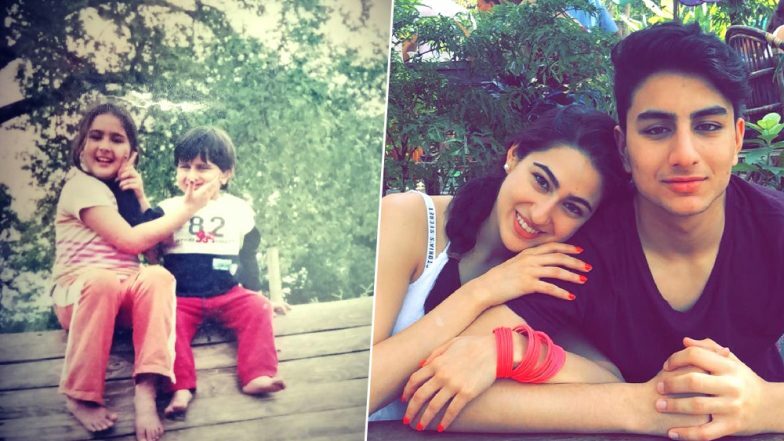 Though Sara Ali Khan maybe a day late to post a picture on social media platforms, she had shared the most adorable photograph we must say. Saif Ali Khan and Amrita Singh’s children, the coolest siblings you’ll ever see who love to chill together. Their journey from being flab to going fab, is truly impeccable and inspiring. They are indeed one of the stylish siblings that we’ll come across. Be it at the parties or any regular outing, this sibling know to grab eyeballs. While sharing the picture, Sara captioned it, “Happy World Siblings Day to my not so little brother #brotherandsister #bestbro #rock #alwaysandforever”. Happy Siblings Day! Did You Know the History and Significance of the Day That Celebrates the Bond of Brothers and Sisters? On the work front, Sara Ali Khan made her acting debut with Kedarnath for which she even won the Filmfare Award for Best Female Debut. She is presently working on her third film which is an Imitiaz Ali directorial. She’ll be seen sharing screen space with Kartik Aaryan in this upcoming film.